Reminded me a little of Ender's Game and a typical Star Trek away mission wrapped up in a coming of age series. The dog talking reminded me way too much of Up (the Disney movie). I can still hear "Poo, Todd?" in the back of my head. 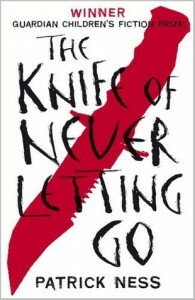 Thanks Patrick Ness. Thank you very much It's a great quick read and worked really well on the Kindle - even the parts where the Noise is in a strange font. Would be neat to see if they'd considered making the Noise into a GIF on the Kindles that support better graphics.